In March 2013, my wife and I traveled to Guatemala to check out Semilla Nueva, a nonprofit our Rotary club was considering supporting as part of our international service. Our past history with nonprofits taught us it was important to make sure the Rotary club’s resources would be backing a valid and sustainable project. What we found and experienced far exceeded our expectations. In Guatemala, corn has been the staple crop consumed across the country for generations. It’s cheap and easy to grow. But it also lacks the key nutrients needed in a healthy diet, resulting in widespread malnutrition affecting nearly half of all children in Guatemala. Malnutrition impacts children’s growth, mental development, school attendance, earning potential, and lifelong health. It creates a cycle of poverty among families and communities. Different varieties of corn were tested. Semilla Nueva realized that in to address poverty in Guatemala, they had to address malnutrition. Our Rotary club and others partnered with Semilla Nueva through a Rotary Foundation global grant. Through trial and error, Semilla Nueva developed an innovative approach. 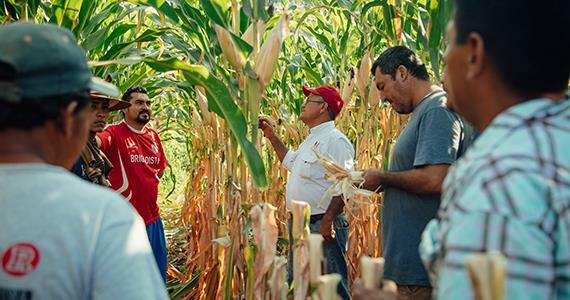 They entered the Guatemalan corn market, offering farmers a more nutritious corn seed. This seed, called Fortaleza F3, is biofortified with more quality protein and zinc than normal corn; both vital to healthy development. Compared to similarly-priced seeds, it also yields larger harvests at a lower price, helping farmers with their income. 1. We worked on the test farm where multiple varieties of biofortified corn were grown side by side. This allowed for a comparison of seeds to see which ones produced the best corn in Guatemalan soil and climate. 2. We traveled to local farms, taking soil and crop samples and spoke to the farmers. One of the brilliant approaches used by Semilla Nueva was to encourage the more progressive farmers to plant a small portion of their farm using the new seed. The benefits of the new seed were irrefutable when seen next to the traditional crop. At harvest, the quantity and quality of the corn proved the superiority of the new seed. 3. Finally, we met with Semilla Nueva’s leadership and discussed their vision, business plan, and long-term strategies for sustainability. A key to their success is engaging scientists, local and national politicians, government representatives, and local farmers. At the end of 2017, Semilla Nueva launched their pilot sales season and within five months they sold out their 1,000 bags of starter seed. Farmers loved the high-quality harvest and profits gained from the seed. More importantly, families, communities, and other consumers were eating more nutritious corn. Today, Semilla Nueva helps other seed companies grow biofortified corn. As of May 2018, their nutritious corn reached 105,698 individuals across Guatemala. Rotary grant dollars are literally “seed money” for growing a sustainable program to eliminate poverty in Guatemala. After the successful pilot, they are already planning for next season. We’re working on a new global grant so Semilla Nueva can produce and sell more bags and types of seeds. The goal of getting biofortified corn to all communities throughout Guatemala is becoming a reality. With their corn reaching tens of thousands, and ultimately hundreds of thousands of people, Semilla Nueva and Rotary are fighting malnutrition and reducing poverty.